At the heart of the Cordillera mountain range rises perhaps its most formidable and enchanting mountain, Mt. Napulauan. Often associated with the memory of Gen. Tomoyuki Yamashita, the “Tiger of Malaya” who sought refuge in its slopes, this mountain (also spelled ‘Napulawan’) possesses a mossy forest unrivalled in its primeval character, as well as trails that earns for it the reputation of being the most challenging in the Cordilleras, and arguably among the most difficult in the whole Philippines. Set in the highland town of Hungduan in Ifugao Province, Mt. Napulauan is mystical. Its name might have been derived from the Tuwale (Ifugao) word “pulaw” which means white, descriptive of the almost perpetual cloud-and-fog cover that makes everything white in the mountain. This may have prompted the locals, long ago, to christen the mountain as "Napulawan" or "whitened". On summer days and fortunate moments however when the white cover disappears, the mountain becomes even more tantalizing: a sea of clouds forms, with distant mountaintops surging up like islands, most notably Mt. Pulag (SSE); Mt. Tabayoc (ESE), Mt. Ugu, (S), and Mt. Amuyao (N). Sunrises have a majestic quality, as there are no high mountains to interrupt the eastern sky. Locals say that the summit is enchanted. A fairy, called bibi-yo, is said to protect it. Ten minutes away from the Hungduan trail, there is a viewpoint where you can see the summit (and vice-versa). On either direction, objects including humans would seem enlarged, hence the viewpoint was dubbed by the locals as “Magical Hill” or “Mirror Mountain”. This phenomenon, however amazing, is an optical illusion: the life-size appearance of the dwarf trees create a relative enlargement of the nearby objects, making them appear as giants. The trail, however, is very challenging. Two trails, the Hungduan and the Hapao , are frequently combined in a traverse. (Anecdotally, there is a third trail, called the Balentimol trail, known to locals but said to be insanely dangerous – passing by ravines with trails less than two feet wide!) Each has its distinct features; even the mossy forest in either trail is unique. 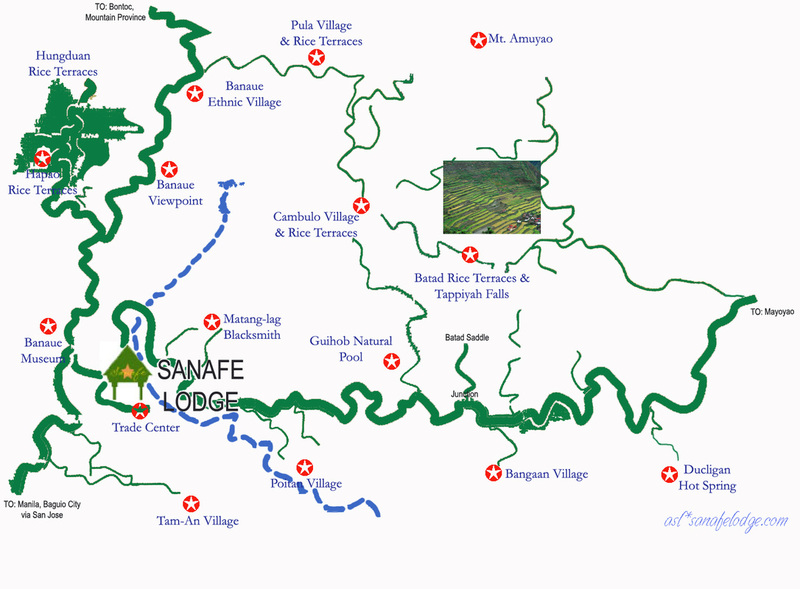 Usually, climbers would start from Hungduan (80-minute jeepney ride from Banaue). The registration site at the municipal complex is in itself breathtaking, having a mini-village and nice mountain views. From the jump-off point (1080 MASL), a very steep “cardiac trail” begins the climb, in what is locally known as the Pirpir area. Being exposed, intense heat might make this even harder. After 3 hours, the Ny-o campsite will be reached (1630 MASL); here one may camp or proceed to the summit. From this east-facing campsite, you can already see Mt. Amuyao, rising majestically (NNW). The beautiful part of the trail begins at around 1900 MASL, where the mossy forest begins. As you go higher, the verdant array of mosses and ferns becomes more and more tantalizing; countless varieties cover the branches and carpet the forest floor. Trees that became whorls in search of sunlight form irrational shapes that create primeval sights, worthy of fantasy novels. It insane shapes would sometimes interfere with the trail, converting in to an occasional obstacle course. Edible fruits such as the upang (a violet berry) and a local herb called hopal are frequent sights, as well as orchids bearing flowers of varied shapes and colors. The fauna is also amazing: deer are said to grow in the lower reaches, as well as wild boars and musang. A notorious resident of the mountain are the leeches (matok in the local dialect). But although the frequently sighted leech is the usual brown one, locals say that there is a much more fearful leech, color green! The author even personally saw a shiny black snake creeping along the mossy floor, and a giant earthworm with a deep blue color! These surreal environments culminate in the garden-like summit which, as mentioned earlier, has dwarf, bonsai-like trees. Here, patches of dwarf bamboo, like that of Mt. Pulag, can be seen, together with another edible fruit-bearing tree, called gutmo. From the Ny-o campsite (1630 MASL) to the peak (2642 MASL) takes around 6-7 hours. On the other hand, the descent via Hapao passes by a mossy forest that is totally unique. Mosses and ferns suffuse the environment, and trees lose their sense of direction, with some growing horizontally. In this anarchy is profound beauty. Boundary stone markers, dividing Brgy. Poblacion and Brgy. Hapao, will be seen several times. The first part of the trail though is down-up, down-up, down-up, sometimes frustrating. After 3 hours, however, a swift descent, of 200-300 m/hour ensues, leading to a grassland which possesses, once more, spectacular views, this time of the Hungduan Rice Terraces, a UNESCO World Heritage Site. Adding to the scene is the Bokiawan river, running clear and majestic across the Hapao valley. Grasses on this part of the trail have sharp, tiny blades that can cause cuts, though. There are deep canals adjacent to the trails; they are hidden by the overgrowth. The final path passes by the cement footpaths of the rice terraces themselves. The entire descent takes an average of 8-9 hours. The reputation of Mt. Napulauan as a formidable trek arises from the lengthy trek time; the obstacle-like and steep nature of the trail, the sheer cold (5-8 C at the summit on December); and other challenges such as the blood leeches. However, the rewarding views – seas of clouds, mossy forests, and rice terraces – make it an epic, unforgettable adventure. 1500 ETA Hapao. Wash up. Rented jeepney to pick us up there. A courtesy registration is done at the municipal hall of Hungduan which is located on a high area. Here, there is a water source and an eatery. Souvenir “I trekked Mt. Napulauan” shirts may be bought for P150. On the jump-off point, guides may be secured. The usual asking price, negotiable, is P500/day/5 hikers. Around 23 guides are available although no formal guide association exists as of 2009. A reliable water source exists near the summit; before that, however, no constant water source exists. Hence it is necessary to bring water according to the itinerary. Cellphone signal for both Smart and Globe is present in both the Ny-o and summit campsites, as well as some segments of the trail. The itinerary above provides ample time for picture taking and delays; a two-day IT is also possible but almost always requires night trekking, and provides little time for a more relaxing climb. Hence, PinoyMountaineer recommends a 3-day itinerary. The summit area is good for a dozen tents at most; the soil is mossy and absorbs water well. Only the south part is obstructed from the viewing tree. Temperatures may drop to 5 degrees Celsius so prepare accordingly. Protection from the leeches (matok) must also be prepared for. At the Hapao jump-off, an open bathing area near a brook may be used to wash up before returning to Banaue.